Ork! Is dear to our throbbing, fat-armored hearts. We didn’t want to phone it in by just cleaning up and re-releasing the old game. Ork! am all new! Ork! am been through playtests! One of those playtests was at this year’s Gen Con, where the game’s creative Orkmaster, Todd Miller, ran a game with the new rules. Todd designs fantastic, absurd adventures. My friend Wood characterized the vibe of Ork! as “stupid things by clever people.” There are many ways to play orks out there in RPGland, but if you want a game about rampaging orks that references Werner Herzog’s Aguirre, the Wrath of God, alcoholic poets, Zardoz, and maybe Thundarr the Barbarian by way of The Road Warrior, we’re there for you, in a low-key sort of way. I think Todd’s adventure was based on John Fowles’ The Magus, but man, not the movie. Well it’s Ork!, so maybe the movie. But with more dismemberment—and ad hoc cures for dismemberment. My main concern (beyond having my character staple back on some errant limbs) was making sure the system worked, and that Cheats did what they were supposed to do. As I mentioned last time I talked about the game, Cheats provide some room for character differentiation, and contribute to the classic rhythm of Ork!, where you’re encouraged to dig yourself a big, violent hole. Cheats let you steal opposed-roll dice from the Orkmaster, but those dice get used against you later. In play, that meant watching dice stack up in front of players until Todd saw fit to drop them on their orks. Cheats sort of act as the flipside of ork points—the magic bean system we use to reward violent, impulsive, orky behavior—but where ork points are rewards for playing like an ork, Cheats represent a way to think like an ork, sealing your doom with short term gain. Indeed, one of the traditional elements of an Ork! game is dying, appearing before the ork god Krom, and seeing whether he’ll let you feast with heroes, or get reincarnated as a pine cone, or a strangely smelly rock. But if you live, there’s room to keep playing. This edition of Ork! 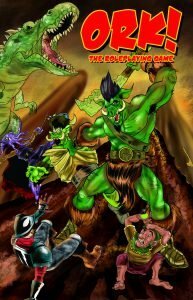 includes an enormous adventure section that can take orks through an entire campaign, from new gunks (junior, nameless orks) raiding the sickeningly cute squishy men for pies and ordnance (see the adventure! It makes sense!) to hardened bands raiding flying fortresses, and even an honest-to-goodness dungeon. You Am Use Smart Idea: Ork! works as parody in part because you can introduce orks into scenarios that, on the surface, seem too smart for them. While you can run through traditional fantasy dungeons and forests and things, reach beyond this low-hanging fruit and ask yourself how orks would mess up Sense and Sensibility or The Seventh Seal (if the latter was good enough for Bill and Ted, it’s good enough for Ork!). Part of the game’s fun is having the players notice themes and references their less, uh, informed characters would miss. You Am Beat Idea Until Goal Fall Out: Once you have a scenario that’s too smart for your orks, wring basic conflicts out of it that work on an orkish level: get a thing, kill a thing, wreck a thing, flee a thing, and so on. Sometimes orks wreck the “normal” story; sometimes protagonists recruit them to deal with a problem in the story, making them Rosencrantz and Guildenstern types (or more likely, Macbeth’s hired killers). Sometimes you need to add an extra fantastical element. Consider My Dinner with Andre as an Ork! scenario. (Really!) As Shawn argues with Gregory about whether his theatre experiences constitute authentic living, this kind of intense discourse may cause ork heads to explode—and indeed, create a reality-breaking aura. Now orks have to break up that conversation to save the world (or their brains) and of course, the taxi and driver, restaurant staff, and strangely animate dishes become foes to be crushed! You Am Keep It Loose: Orks wander off, kill each other and occasionally explode after an unwise meal, so while you can design adventures around scenes, these should feature plenty of room to go off-script. Every scene or location should be an amusement park filled with things to experience and often, destroy. In other games, designing locations and scenes might benefit from sticking to the overall story arc, Ork! benefits from lots of weird, wonderful and “irrelevant” detail. Include plenty of things for orks to steal, eat or kill that fit the premise of a scene or place, but may have nothing to do with the plot. 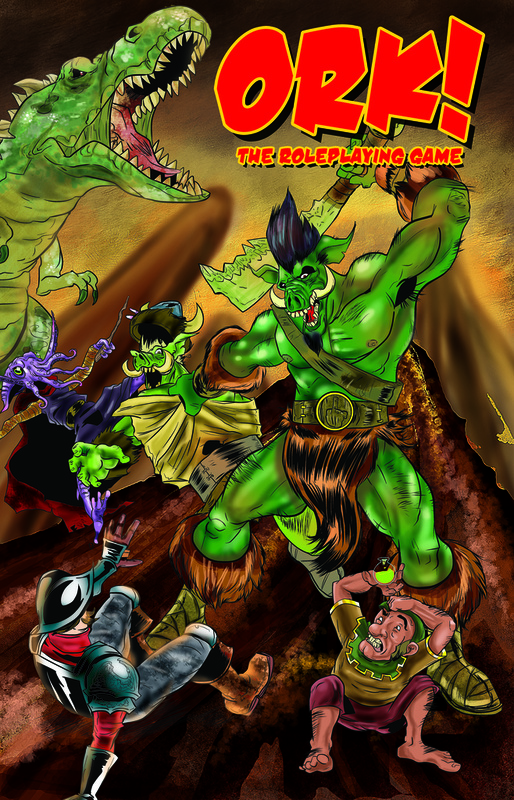 You Am Add Warlock: When it doubt, get the warlock to make orks do stuff! The warlock is the GM’s mouthpiece, and since orks are expected to be directionless and unfocused, it’s okay to use the warlock to kick them in the right direction. That’s the story-brutalizing violence which makes Ork! work, and it’s what we’ve got coming. And green pig faces. Because that’s what orks look like. You know it.